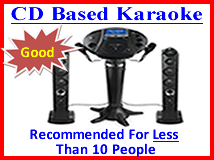 CD based Karaoke Machines are more affordable, but you have to load each CD in, one by one, for each singer each time. 5,000 songs available on CD's! 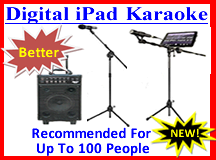 Digital Karaoke Machines are louder and better quality and all songs are accessed on the iPad and require a High Speed WiFi connection, AND access to electricity. No need to mess with loading CD's when you use the digital machine with 30,000+ digital songs available. 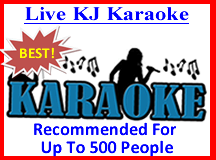 All Karaoke rentals need access to electricity!